The giant armadillo is the largest of all armadillos and found in South America, east of the Andes, from northwestern Venezuela to northeastern Argentina. Adults grow as long as 35 inches and can weigh over 70 lb. The necks and backs of armadillos are covered with flexible carapaces (shells) consisting of 14 to 17 moveable bands of horn and bone. Their heads are also covered with a similar oval shield. The head, tail and lower edges of the giant armadillo are nearly white, and the rest of the body is dark brown. Underneath the carapace, its naked body appears wrinkly and pinkish in color. It has powerful claws with a very large central claw similar to the claw of the giant anteater. Giant armadillos are very fast on the ground and can sometimes balance themselves on their hind legs and tails, with their forefeet off the ground. Giant armadillos prefer to live in burrows near water in grassland, brushland, woodland, and forests where termite mounds are present. It is believed that they are very good swimmers. They are active mainly at night and prefer to sleep in the daytime. They are very powerful and quick diggers enabling them to find insects and escape predators by hiding in the ground. Preferred diet is ants and termites, but they will also eat other insects, worms, spiders, larvae, snakes, and carrion. Giant armadillos can consume entire termite mound populations once discovered. Little is known about the mating behavior of this species. Other armadillo species are known to pair up during mating season and share a burrow. Females give birth to one to two young after a gestation period of 120 days. The young armadillos are born with tough leathery skin to protect them from dangerous predators. 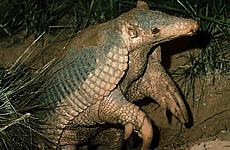 Giant armadillos have suffered from loss of habitat due to agricultural development and human settlement, and they are also overhunted by humans for food. Some are killed by farmers because they are thought to damage crops. This species was listed as endangered in 1976, and the continued study of the species and its habitat is necessary to plan additional conservation efforts. Copyright Notice: This article is licensed under the GNU Free Documentation License. It uses material from the Wikipedia article "Giant armadillo". Glenn, C. R. 2006. 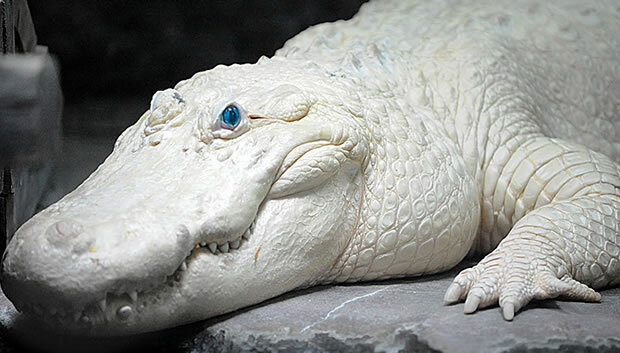 "Earth's Endangered Creatures - Giant Armadillo Facts" (Online). Accessed 4/23/2019 at http://earthsendangered.com/profile.asp?sp=11&ID=11. Need more Giant Armadillo facts?